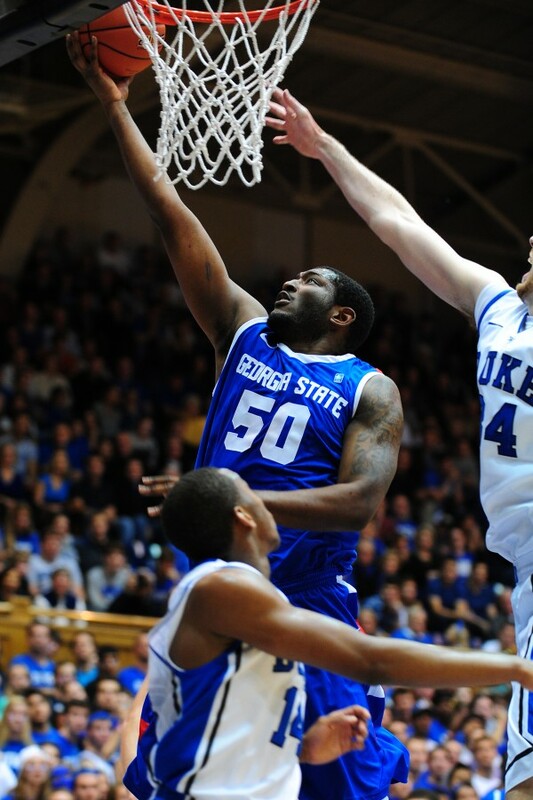 James Vincent scores versus Duke on Nov. 9, 2012. Vincent has two nicknames– "Big Fella" and "Oak." 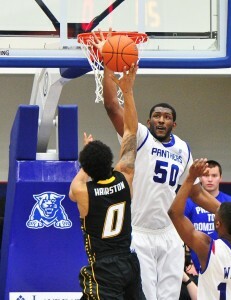 Photo courtesy of Georgia State Athletics. These alternative monikers may define the athletes just as much, even more in some cases, as their night in and night out performances on the field or court. 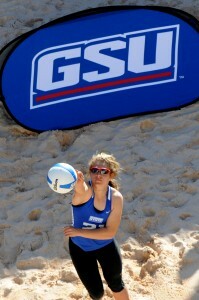 Several athletes at Georgia State have secondary identifications that go beyond their birth names. And they all have unique origins. ￼James Vincent, who also goes by “Oak,” uses one of his limbs to alter a shot versus Townson on Feb. 9. Vincent recieved the nickname due to his tree-like stature and strength. Senior James Vincent, an opposing 6-foot-10 center on the basketball team, is so big he commands two nicknames. Chris Locandro, a junior on the soccer team, is an All-CAA defender and has been honored with several academic awards during his time at Georgia State. He also earned the nickname “Drago” during preseason conditioning his sophomore season. While sports nicknames are com- mon, not every player has one and those that exist may not even stick among fellow teammates and fans. How well-known one becomes may depend on several factors, ranging from player performance to the actual complexity of the name. Players may also refer to their teammates by nicknames as a way of establishing stronger friendships and bonds. Teams tend to be tight knit, almost family-like, due to their long hours together and common goal of winning championships. Nicknames are bound to form within this dynamic. Moss, whose middle name is Gabriel, has been called Gaby since she was a little girl, a name her mom always liked.